Primo 8B flash per Luca Rinaldi che a Brione riesce a risolvere al primo tentativo "Blinded by the light". "I want to remember this day. 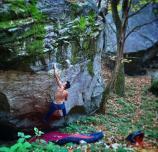 I flashed "Blinded by the light 8B" ... I didn't this things for so long time... I sat there and I did my first attempt from the start...My mind was free from thoughts and I was on top of the boulder...my first 8b flash...maybe think it is a little bit easier than 8b but now is not important..."
Luca racconta la sua salita su PlanetMountain.